Flossing after every meal will help keep your teeth and braces clean, which will also help keep your treatment time on track. 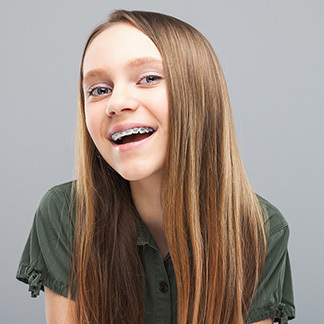 To floss with braces, use a floss threader or special orthodontic floss to thread the floss behind each wire. Wrap the ends of the floss around your pointer fingers of both hands, leaving a few inches of taut floss between them. Gently slide the floss between each set of teeth using a back and forth motion. Floss the sides of each tooth beneath the gum line to remove plaque and food particles. Repeat this process until you’ve flossed all of your teeth. If you find that your floss is not removing all of the food particles between your teeth and around your braces, you may want to purchase a water flosser!